Non-state social orders (local orders)—tribal, Islamic, mafia-based, etc.—can exert significant control over their populations, supplementing, and occasionally replacing, state-level governance. In this paper, Matthew J. Nelson outlines four cases of local orders in India, Pakistan, Bangladesh, and Afghanistan. Noting that these orders are quite difficult to change, he analyzes the ways in which Western social and governmental organizations might be able to engage with members of these communities more effectively by working within these orders rather than against them. He asserts that the challenge does not lie in replacing local orders with a monolithic appreciation for state power, but in developing the area-specific knowledge required to operate within local orders while, at the same time, appreciating the delicate balance, and difficult trade-offs, between them. The first two case studies describe local orders in India and Pakistan. Each draws attention to a relatively stable mafia or protection racket affecting local property relations, and each concludes with an account of governance and security-related concerns, asking how the international community might intervene. For those with an interest in the well-being of marginalized groups (e.g. women and the urban poor), the answers are far from obvious. In India, efforts to address the immediate interests of the urban poor occasionally involve stepping away from the rule of law. But in Pakistan, efforts to protect the property rights of Muslim women may involve a push to enforce Islamic law. The second two cases move away from a limited account of local orders to consider efforts on the part of international actors to “translate” Western norms in Bangladesh and Afghanistan. Both cases describe patterns of translation between Western norms and local orders with broadly unexpected consequences. In Bangladesh, European Union (EU) officials seeking to promote “the rule of law” discovered that the meaning of this phrase was transformed as it traveled from Brussels, via elite NGOs, to local villagers. In Afghanistan, an American NGO working with local mullahs found that its (successful) efforts to translate women’s rights into local articulations of shariah were dismissed by key donors in Washington. Nelson concludes that those seeking new ways to engage local orders require a deep appreciation of the multiple types of authority that exist in the same community, and an understanding that any effort to stress just one will produce a corresponding reaction in the others. 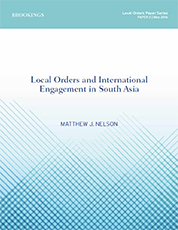 He asserts that nuanced patterns of engagement with local orders are not impossible, but across South Asia the political dynamics underpinning such engagements are complex. Although over-centralization has a tendency to produce specific forms of resistance, the creation of bright boundaries between alternative orders often has a similar effect. Nelson writes that blurry boundaries are normal. The challenge lies in locating a skilled cadre of “translators” to toggle across these boundaries.